Satyagraha (Sanskrit: सत्याग्रह satyāgraha) is the idea of nonviolent resistance (fighting with peace) started by Mohandas Karamchand Gandhi (also known as "Mahatma" Gandhi). Gandhi used satyagraha in the Indian independence movement and also during his earlier struggle in South Africa. Satyagraha helped shape Nelson Mandela's struggle in South Africa under apartheid, Martin Luther King, Jr.'s campaigns during the civil rights movement in the United States, and many other similar movements. Someone who does satyagraha is a satyagrahi. The word Satyagraha is from the Sanskrit words satya (meaning "truth") and Agraha ("insistence", or "holding firmly to"). 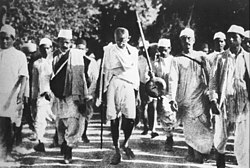 For Gandhi, Satyagraha went far beyond just "passive resistance" (resisting without taking action) according to him it was a moral force born of truth and non-violence. His non-violence also became his strength. He said that he chose the name because Truth means Love, and Insistence means Force, and the Sanskrit name showed it was a force born from Truth and Love (non-violence). He also wrote that he liked the term "Civil Resistance" better than "Civil disobedience". Gandhi also translated it as "love force" or "soul force". In most conflict, the goal is to defeat the enemy, to stop him from meeting his goal, or to meet a goal that the enemy is trying to stop. But in Satyagraha, these are not the goals. The goal, Gandhi said, is to change the mind of the wrong-doer, not to force him. Winning means getting along with the enemy to make what is wrong right again, which they might not realize is wrong. For this to happen, the enemy's mind must change to realize that he is stopping a goal that is right. Chastity (brahmacharya) — this means keeping moral sexually, but also giving more attention to following truth than to satisfying urges. Freedom from untouchability, or the idea of a caste (a group of people with the same amounts of money and power) that is so low that it "cannot be touched". must follow all other rules of discipline he gave them . ↑ In his words: "Truth (satya) implies love, and firmness (agraha) engenders and therefore serves as a synonym for force. I thus began to call the Indian movement Satyagraha, that is to say, the Force which is born of Truth and Love or non-violence, and gave up the use of the phrase 'passive resistance', in connection with it, so much so that even in English writing we often avoided it and used instead the word 'satyagraha'...." Satyagraha in South Africa, 1926 from Johnson, p. 73. ↑ In a letter to P.K.Rao, Servants of India Society dated September 10, 1935, quoted in Louis Fischer's, The Life of Mahatma Gandhi, Part I, Chapter 11, pp. 87–88, "The statement that I had derived my idea of Civil Disobedience phrase to explain our struggle to the English readers. But I found that even "Civil disobedience" failed to convey the full meaning of the struggle. I therefore adopted the phrase "Civil Resistance." This page was last changed on 21 April 2019, at 07:28.